Members not only fund our change-making programming, but they help inform our direction, provide direct action with their elected officials, and empower local bicycling initiatives. This became absolutely clear when the League mounted a campaign for a "vision test" in the AV START Act last year. When Congress went ahead with a bill that would have largely allowed the auto industry to set its own safety rules for Autonomous Vehicles, our members flooded Senate offices with 8,000 messages opposed to the bill that didn't make the roads any safer for bicyclists or pedestrians. To count yourself as an agent of change for bicycling, join the League during our Spring Member Drive! 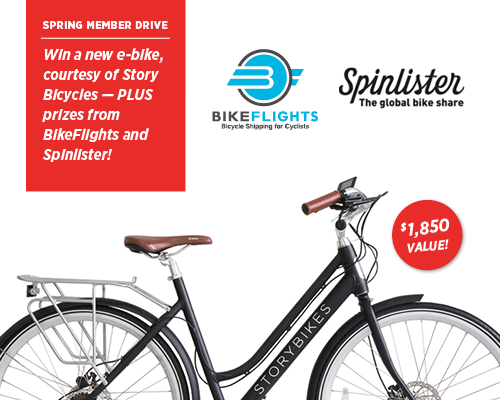 For this month only, you'll be entered to win a Story Bicycles e-bike, a BikeFlights voucher, and all new and renewing members will ride off with $20 in Spinlister credit. Roar Adventures: League of American Bicyclists Members save 5 percent or more on amazing bike tours around the globe with Roar Adventures. Roar Adventures' team of cyclists hand-picks amazing bike tours, bringing you a broad range of cycling experiences with top-notch service and knowledgeable local guides. Find your next bicycling travel adventure and take advantage of your member discount at RoarAdventures.com. Take advantage of these and any of our benefits for bicyclists by emailing membership@bikeleague.org for discount codes or links. Join the League to be the first to hear about new or special benefits--and to support our work throughout the year.